Broccoli has a bad reputation. 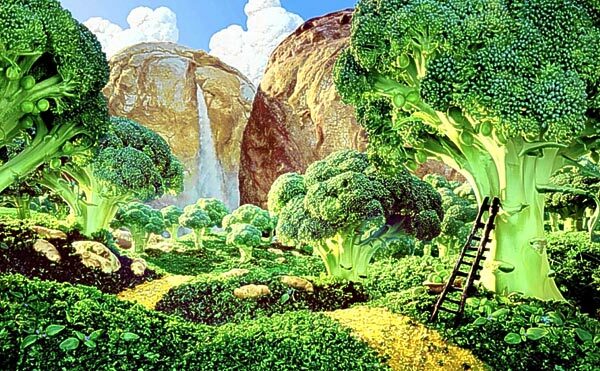 Could you define the market — everybody has to buy food sooner or later, so you define the market as food, therefore, everybody is in the market; therefore, you can make people buy broccoli. Do you see a theme here? The president’s mother made him eat it. Justice Scalia is worried about people being made to buy broccoli*. Why is it that so many people hate broccoli and see it as something you eat because it’s healthy food, and even then you choke it down reluctantly, probably smothered in Cheez Whiz? That’s not fair to broccoli. Oh, and don’t give me the old “I hate it because I’m a “supertaster” argument, either, because we found out at a science fair that Dave is a “supertaster” and he loves the hell out of broccoli. Yes, broccoli is good for you. But why do so many maintain the belief that “good for you” and “tastes like crap” are synonyms? You’ve got goodies like folate, Vitamins K and C, fiber and calcium, all contained in a vegetable that looks like a tiny tree! I found a way of preparing broccoli that might, maybe, be able to convert some antibrassicans into broccoli eaters. Voluntary ones. If all you’ve ever had is floppy, overcooked broccoli, then of course you hate it. Boiling or steaming the life out of something isn’t usually putting it in its best light, you know? Preheat the oven to 425F. Nice and hot. Cut the broccoli into little florets, then toss them with the olive oil, salt, pepper, and garlic. Dump it onto a baking sheet in a single layer, and then put it into the oven for 15-20 minutes. Check it after 10 minutes, stir everything around a little, and put it back in. You’re looking for the point after the florets to start turning a little brown but before they get floppy. You should be able to get a fork through the stems, but they should offer some resistance. Take them out of the oven and toss them with a little lemon zest (just a little) and a tablespoon or two of lemon juice, depending how lemony you want it. I juiced half a lemon into two heads of broccoli and it was too much. Let it cool a little before adding a handful of parmesan and serving it up. If you hate broccoli because of its bitterness, this is a recipe to try before giving up on it entirely. Roasting at a high heat takes all the bitterness out of broccoli and adds a sweet, nutty flavor. The garlic and lemon and cheese just take it to a whole new level. Try it, and then come back and tell me if you liked it. *I know that’s not the actual argument he was trying to make. I still think it’s silly. This entry was posted in Uncategorized on June 28, 2012 by antijen. I love broccoli! It’s the best! When I was married to my ex-husband, one of my best friends and her husband would invite us to dinner and that’s the only veggie she ever served, because it’s the only one all four of us liked! That said, I cannot BELIEVE you are promoting FLORETS over the mighty STEMS! It is a cruelty of the world that more people do not know the joy of pure, unvarnished broccoli flavor without the weird uvula-tickling that comes with miniature trees in your mouth.